Around the year 1000, Gudrid Thorbjarnardottir was surely the most widely travelled woman in the world, and would remain so for another five hundred years. 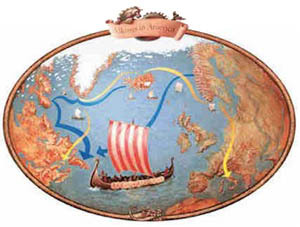 Gudrid was in every way the equal of the men who crossed the seas in their swift Viking ships and explored the entire Western hemisphere. Gudrid was born in Iceland, married in Greenland, gave birth to a son in North America, travelled to Norway, farmed in Iceland and made a pilgrimage on foot to Rome, before ending her days as a nun and anchoress in Iceland. She was a formidable, independent-minded woman, who fashioned her fate with her own hands, and with modesty took her place among the great female heroes of history. © 1997 – Leifur Eiriksson Publishing Ltd.